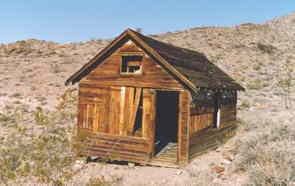 NAME: Schwab and Inyo Gold Mining Camp. REMAINS: A few buildings and remnants. 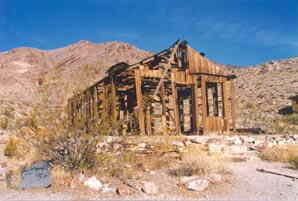 After the 1904 strike that begat Rhyolite, prospectors clamored all over the Death Valley country in search of the "Lost Breyfogle." The Funeral Range that separated Death Valley and the Amargosa Valley was no exception, for from any of their summits Rhyolite can be seen. 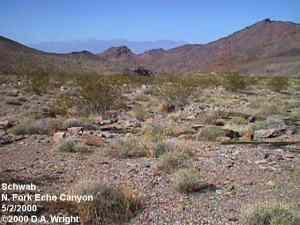 In January 1905, a Mormon prospector by the name of Chet Leavitt crossed over the Funeral Range and into Echo Canyon, which courses down the west side of the range and into Death Valley. Waking up one morning, he found it necessary to chase down his pack animals, which had wandered off for the night. He found them standing by a big quartz blowout, and he then forgot about his horses. Leavitt and his partner, Moroni Hicks, probed around and broke off a few chunks of ore for future assays. They dubbed the ledge the Stray Horse. The assays proved the rock worthless, but Leavitt and Hicks were undaunted. They returned to the site and kept prospecting it until they found a rich vein a little further up the hill. 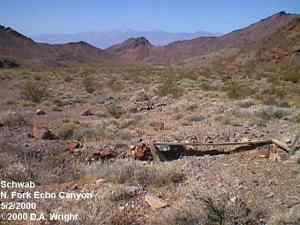 They then took out over 20 claims on the surrounding ground, including the Inyo Mine. Later, Leavitt and a few Mormon friends from Provo, Utah, joined together and bought out Hicks' share, then formed a corporation called the Inyo Gold Mining Company. At 65 feet, the miners broke into rich ore, which caught the attention of Charles Schwab, the steel magnate from Pennsylvania, who himself kept a close eye on anything promising in the entire region. 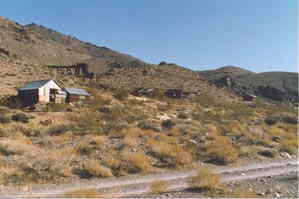 The Inyo Mine developed into a fairly substantial camp, although no services attendant to a real town developed. A blacksmith shop, boarding house and store served the camp's employees. 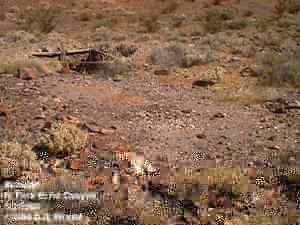 Meanwhile, close to the Stray Horse, a gold bearing talc deposit, much like that of the fabulous Montgomery-Shoshone of Rhyolite, was discovered, which Schwab purchased for himself in May 1906. Schwab then incorporated the Skibo Mining Company, the name of the Scotish castle belonging to Andrew Carnegie and placed that romantic sounding name on a less than romantic landscape. The townsite of Schwab was laid out just below the Skibo in honor of the steel and mining magnate. Five boxcars of tents and supplies were shipped from Los Angeles to Rose Well via the Los Angeles & Salt Lake Railroad, then transferred to the Las Vegas & Tonopah Railroad at Las Vegas, in January 1907. Within a couple of months 200 people came to Schwab and a post office was opened March 18 of that year, with Eugene P. Houtz taking the role of postmaster. The Echo Miners Union took up the cause of the working stiffs. 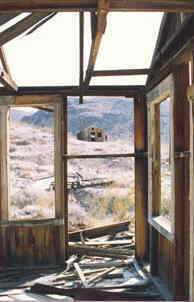 A telephone line was run from Rhyolite, via Lee and Echo, to the camp. 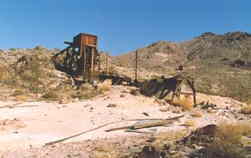 A daily stage line made through connections to Rhyolite. Schwab was noted for two things: town government by women and a sudden and swift demise. The townsite company was taken over by three women: Gertrude Fesler, who was a young stockbroker from Chicago; Mrs. F.W. Dunn, from San Bernardino; and her daughter, Helen H. Black. 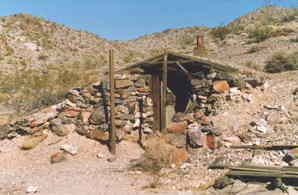 This form of government caused a publication to be written and circulated, "A MINING CAMP BUILT BY LADIES: ONE OF THE MOST UNIQUE WONDERS OF THE NEW WEST." Soon the women began to question the morality of "their" camp, and then they took action in cleaning out "their" town of saloons, gamblers and "sporting women." Most of the men followed. Five boxcars of tents and supplies quickly left Schwab as quick as they came in. On August 15, 1907, the post office closed its window for good, and quiet, solitude, discarded cans and broken bottles remained at what became the namesake of a wealthy Pennsylvanian and a Scotish castle. 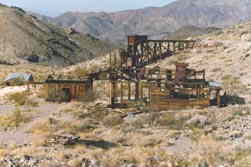 The Inyo Gold Mining Company continued to operate its Inyo Mine, although it was shut down during the financial panic of 1907 and 1908, as did the vast majority of other excitements in the vicinity. After 1928, however, interest was again directed at the mine and it was worked on and off until 1940. 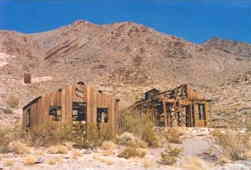 The remains at the Inyo Mine (often confused with nearby Schwab, which never attained a solid structure in its abbreviated life) are from this later period. As for Schwab townsite, it takes a sharp eye to find the location of the town. 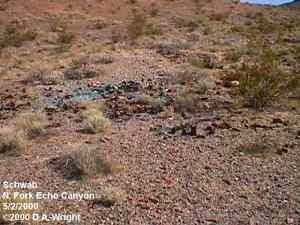 Only a few leveled spots in the canyon, a few piles of rusted tin cans and broken glass mark the site where three women attempted to clean house.Submitted by David A. Wright Great Basin Research - Ridgecrest, CA . Wood lined cellar and leveled tent site in what appears to be main street of Schwab. In this era, tents large enough to contain a business or a family home were built with a wooden base, raised a foot or two above the ground; on which a canvas tent was erected. Such tents may also have short wood walls, three or four feet in height. Next to this site was a fairly extensive can and bottle dump, indicating a possible saloon. May 2, 2000. �2000 D.A. Wright. Can and bottle dump. Schwab, CA. May 2, 2000. �2000 D.A. Wright.